A mentor, guide, confidant, friend - a teacher plays multiple roles in shaping a child's identity and helping them realize their dreams. Though we celebrate every Teacher’s Day with our mentors, recognising and thanking the people who are key in helping our country grow is imperative too. Without them, we wouldn’t be celebrated for our achievements worldwide, neither would we have people we now consider as our heroes. So, this Teacher’s Day, Sony Pictures Networks India’’s (SPN) kid’s entertainment channel - Sony YAY! has taken upon itself the onus to commemorate the energy and efforts of our teachers as they shape the biggest role models of this country. 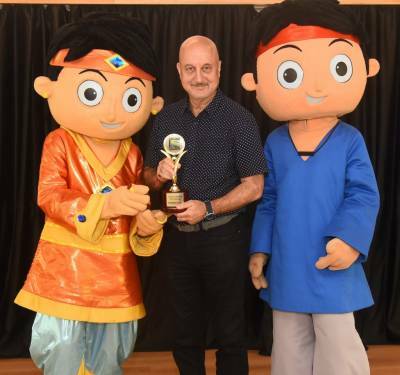 The channel's most loved characters, Prince Jai and Dumdaar Viru, honoured the real heroes for their effort and for giving the country some of their most revered champions. One of the people acknowledged by Sony YAY! was Mahavir Singh Phogat, the man of steel behind the heroic success of his daughters, Geeta and Babita Phogat who have become India’s most renowned female wrestlers, bringing India unprecedented glory. Ace choreographer, Shiamak Davar, who trained over a million of students since he started his journey over two decades back has given the country dancing stars like Shahid Kapoor, Varun Dhawan, Sushant Singh Rajput and many more. Shiamak has led his students to represent India at prestigious platforms like the Commonwealth Games amongst others making him the finest dance guru the country has seen till date. Amongst these heroes, Shaheen Mistri was recognized as well. An Indian social activist and educator, she is the founder of the Akanksha Foundation, an Indian educational initiative in Mumbai and Pune, and is also the CEO of Teach For India, helping children of the country grow and helping them follow their dreams. Padma Bhushan and Padma Shri awardee Anupam Kher, credited with leading one of India's biggest acting schools, was commemorated for mentoring and honing the talent of some of India's biggest superstars including Deepika Padukone, Abhishek Bachchan, Hrithik Roshan to name a few. One of the most revered Indian classical dancer and teacher, Pandit Birju Maharaj was also felicitated as the part of the campaign for his unfaltering efforts for over six decades in teaching the classical dance form of Kathak to students in the country and across the world including celebrities like Madhuri Dixit, Deepika Padukone and others. We, at Sony YAY!, want to be the ultimate happiness destination for kids, on television and beyond. The idea of ‘Heroes behind the Heroes’ stemmed from this thought of spreading joy not only to kids but encourage them to pass it on to people who shape their lives. Through this unique initiative, we want to thank all teachers, who are the true backbone of the nation, for all the time and effort they have put in to bring out the greatness in all their students. On this Teacher's Day, we’re thanking the teachers who have helped make our favorite people who they are today. I thank Sony YAY! for this lovely award that’s been given to me and I’m very happy to be honoured with this because as a teacher, I’m so happy that Shahid, Sushant, Boman, Aishwarya and everybody who has been with me for so many years has really gone forward in their careers. So for me, it’s a very big honour and I’m very grateful. Thank you, Sony! “Thank you so much and I felt really nice because I have spent my whole life teaching. It doesn’t matter what field you are in, according to me the position of a teacher is that of God. Since the start, I am teaching kids and I will always keep teaching them. I’m really happy to receive this award from Sony YAY! Channel”.